In the house where I grew up, family photo albums were packed into the deep bottom drawer of a desk in my parents’ bedroom. The drawer had to be tugged out slowly before the largest album, leather-bound with black pages, could be retrieved. It was a lot of work for a little girl. But there is nothing like a child’s fascination with old photographs. One in particular intrigued me when I was young, causing considerable puzzlement. Now it is 50 years later and much of my parents’ stuff, including the album, is in my possession. So I asked them about it. The story is that a newspaper photographer snapped the picture, which accounts for its large size. Of course, that fact would have caused even more confusion if I had known it as a child. 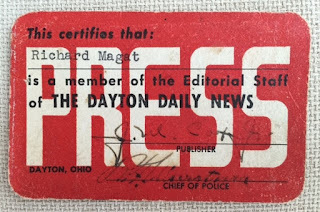 He and my mother had left New York in 1949 and moved to Dayton when my father landed a job as a reporter for the Dayton Daily News. He had a couple of beats, including the courts which were located two blocks from the newspaper offices. They lived in Dayton for two and a half years. At first, they rented a room in a boarding house where the bathroom could be reached only by walking through the kitchen. That’s where Darlene, a gorgeous redhead whose grandmother owned the house, hung out smoking cigarettes with her boyfriend, a minor league ball player. The old lady told my mother that when she was a little girl her father planted potatoes in March and now – in 1950 – the farmers would plant them in May. Today, my mother is an old lady telling me that they would drive 50 minutes to Cincinnati to go to the theater, and saw Death of a Salesman with the original cast. Back to the courthouse, I see why the picture unsettled me as a child. At an early age, we learned to smile politely at the camera and these three people have not followed that rule. Also, the room looks like a library, and we were taught to be quiet in libraries. Also, the woman standing so close to my father is not my mother. Then there’s the guy with the drink. What was he saying? Was something stuck to the ceiling? And what on earth was SO funny? The photo is a reminder that children will persistently try to reason through things that don’t make sense. 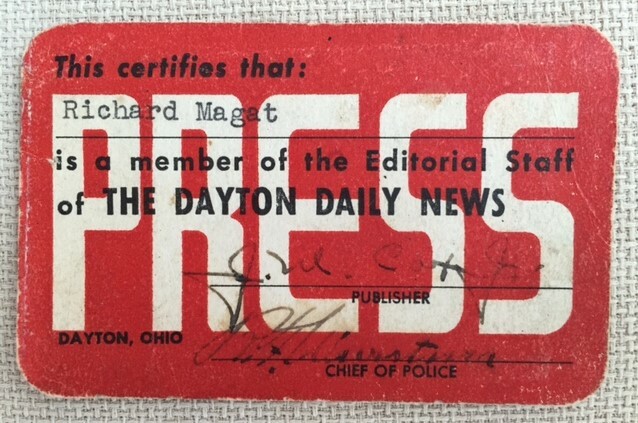 But in the end, it’s probably just a Christmas party in Dayton, 1950. See post January 17, 2018. No prompts are more enjoyable to me than photographs. isn't it funny how, as I child, you constructed a story made completely of question marks? One thing I did not mention is that Julius and Ethel Rosenberg went on trial in March 1951. My parents got caught up in a circle of people who believed they were innocent. It was a difficult time.